For the longest time ever, I have been obsessed with curly, wavy hair. I love those hairstyles that have loose, wavy curls that look absolutely classy but still have that "I didn't focus too much on my hair look", you know what I mean?! The Irresistible Me Sapphire Curling Wand* gives me that look that I desire and many different other curly looks that I want. Keep on reading to find out more..
First up, what comes in the box? Inside the box, there is a huge array of wands alongside a glove. The glove is extremely handy as I have already burnt myself (that's because I was lazy). The wands come with 8 different interchangeable barrels that range from 13mm to 25mm. The good thing is that the wand does not take too long to heat up which is an advantage as this would be good for doing your hair in a rush. The temperature control ranges from 230C to 450F which only takes up to 20 secs to heat up. Also for those that travel a lot, the curling wand and barrels come in a travelling pack so there's no hassle. Each barrel creates different hairstyles, whether that be tight perm curls, ringlet curls, beachy waves, ribbon curls, spiral curls, flick curls and finger wave type curls that last all day. But the real question is how do I feel about it? I have used this on a few occasions at the moment and I must say I love this curling wand. The wand heats up really quick and the barrels provides various looks. The two barrels that I am currently obsessed with would have to be the Pearl and 25mm as together they provide such a flawless, effortless look that I love! The curls stay in the whole day without dropping especially if you use an amazing hairspray. You will definitely be seeing more of this on my blog as I don't think I'll stop talking about it. Kindly enough, I was given a discount code for anyone that wants to use it, you can get 10% off anything at Irresistible Me! The good thing about this company is that it sells hair extensions, hair straighteners, full lace wigs and some cute accessories! Use the code: IrresistibleLee to get 10% if you do shop. Have you ever tried anything from Irresistible Me? 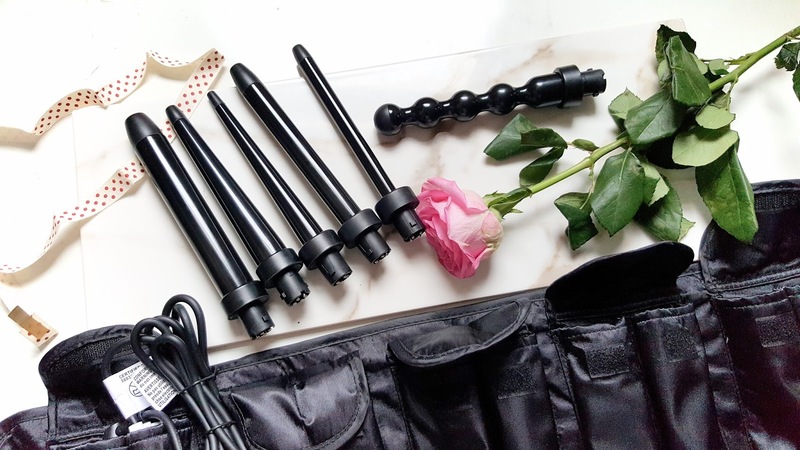 Or do you have a curling wand that you are in love with?